Sarah Stang is a PhD student in the Communication and Culture program at York University in Toronto, Ontario. Her research focuses on race and gender representation in video games and other media, with particular interest in monstrosity, hybridity, abjection, and otherness. Video games, particularly role-playing games, have addressed madness in various ways since their inception, though usually in the form of villains and antagonists whose sole motivation for their evil deeds is their madness. Although inclusivity is important, connecting madness (among other marginalized identity markers, such as gender deviance, queerness, and femininity) with villainy only serves to further alienate and demonize those who identify as mad or have been diagnosed with a mental illness. As Edmond Chang (2017) observes in his discussion of queerness, madness, and BioShock, “insanity has been stereotypically used as an outward manifestation of an interior perversion” (p. 236). That “interior perversion” in games is usually evilness; obsession with revenge or power; or the desire to destroy the world or spread chaos. Many video games feature violent villains who cackle maniacally; display extreme mood swings; have severe identity crises and mental breakdowns; are delusional or psychotic; display sociopathic, narcissistic, or psychopathic behaviours; or are simply described within the game using ableist language such as “crazy,” “unhinged,” “deranged,” “criminally insane,” etc. Some famous examples are Kefka (Final Fantasy VI, 1994), SHODAN (System Shock, 1994; System Shock 2, 1999), Sephiroth (Final Fantasy VII, 1997), Chai (Shenmue, 1999), Dahlia (Silent Hill, 1999), Sander Cohen (BioShock, 2007), GLaDOS (Portal, 2007; Portal 2, 2011), The Joker (Batman: Arkham series, 2009-2013), Vaas (Far Cry 3, 2012), and Pagan Min (Far Cry 4, 2014). Beyond generally being inaccurate representations of mental illness, these villains underscore the offensive and dangerous association of madness with violence which prevails in Western culture. Other than being a “motivation” for villainy, madness and mental illnesses are sometimes used in games as a mechanic or affordance which influences the gameplay experience. This is a difficult approach to take and can lead to mixed results. For example, Aaron Souppouris (2015) points out that many games which include mental illness as a mechanic problematically attempt to quantify “sanity” or “insanity” with metres, as in Eternal Darkness: Sanity’s Requiem (2002) and Amnesia: The Dark Descent (2010). He identifies Hellblade: Senua’s Sacrifice (2017) as a game which better enfolds mental illness into its narrative, although it has been critiqued by others for invalidating real experiences of mental illness and merely using psychosis as a plot device (Faulkner, 2017; Lacina, 2017; Scaife, 2017). Although Hellblade has been both applauded and critiqued for this supposedly novel approach, there are earlier games which also used psychosis as an in-game mechanic without resorting to sanity metres. 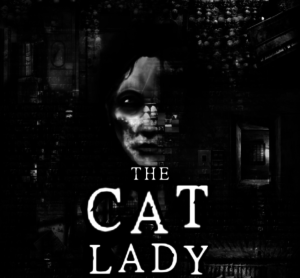 The Cat Lady (2012) and Fran Bow (2015) are two independent psychological horror adventure games which articulate the tensions and connections between perceived madness, psychosis, and seeing hidden truths. In this article, I discuss the way Hellblade has been praised and critiqued for its use of mental illness as a mechanic in order to compare it to The Cat Lady and Fran Bow. Although I discuss various critical responses to Hellblade, this essay focuses primarily on The Cat Lady and Fran Bow, as the immensely popular Hellblade has already been discussed at length by game journalists and critics (Briers, 2017; Faulkner, 2017; Gerardi, 2017; Kim, 2017; Lacina, 2017; McKeand, 2017; Scaife, 2017). I argue that while there are problems and limitations with the representation of psychosis as a mechanic/ability/superpower in The Cat Lady and Fran Bow, they both present interesting and fully realized mentally ill characters who are sympathetic and heroic. They also address important themes and issues which are under-explored in video games, including the complicated nature of medication use, the risks associated with medical facilities, and the powerlessness faced by women and children who are labelled mad. Most importantly, these games also focus on overcoming fear, self-doubt, and isolation, and demonstrate that people with mental illnesses can be heroic, can help others, and can form lasting, meaningful friendships. I demonstrate that through these themes, The Cat Lady and Fran Bow emphasize the importance of healing rather than curing for their protagonists. I therefore argue that both games are important examples of ways in which games can provide more diverse, empathetic, and respectful representations of mental illness. In Hellblade, players use the protagonist Senua’s mental illness as a power to solve puzzles by finding patterns and connections where none really exist. As Dia Lacina (2017) observes, this creative psychological process is called pareidolia; though this is a widely experienced phenomenon, it is more commonly experienced by people with psychosis. Senua’s mental illness functions within the game as a kind of superpower, allowing her to see what others cannot; to see what is really there, to see truth. Although the term is not used in these games, I use “true sight” as a way to label the general ability to see what others cannot, such as the supernatural, alternate realities, other dimensions, the past or the future, or hidden truths. I use this term instead of pareidolia because pareidolia has been most often linked to seeing faces in faceless objects, like the moon or a slice of toast. True sight is broader than that, and is more clearly a kind of power. I borrow the term from Dungeons & Dragons (TSR/Wizards of the Coast, 1974-ongoing), the incredibly popular tabletop collaborative role-playing game which was the precursor to digital role-playing games. True sight was introduced in the first issue of The Dragon magazine (1976) as a spell which allows the caster to see the world as it actually is, which involves seeing through illusions and seeing “invisible, displaced, and astral objects” (p. 23). This term is useful as an umbrella category for the abilities which are granted to characters like Hellblade’s Senua, Susan from The Cat Lady, and Fran from Fran Bow. In all three games, mental illness is framed as both a gift and a curse: although each character suffers from alienation and experiences terrible visions and trauma due to their madness (which is represented in these games as general psychosis and hallucinations), that madness also gives them the ability to solve puzzles. While “solving puzzles” might seem like a weak payoff for the horror and pain these characters experience, solving these puzzles allows them to uncover truths about themselves and others, heal their pain, and, in The Cat Lady and Fran Bow, develop connections and friendships with others. While it is refreshing to see madness portrayed in a less negative way, by framing it as a superpower or magical ability like true sight, these games risk romanticizing mental illness and invalidating the lived experiences of people with these illnesses. In her discussion of Hellblade, Lacina (2017) points out that in real life, at least for her, mental illness does not function like a superpower and at no point has her mental illness ever saved her from harm or given her profound insight into the true nature of reality. While she applauds the developers for working with mental health professionals during development to “show” how trauma can impact and incite episodes of severe mental illness” and for attempting to “construct a sensitive lesson plan for a neurotypical audience about mental illness,” she concludes that the game’s shortcomings cause it to “hurt more than it could possibly help” (para. 17). One of Lacina’s (2017) primary concerns with the game is that it removes Senua from any social context, and because players never see her struggling to exist in society, the game’s attempts at sensitivity and didacticism are undermined. 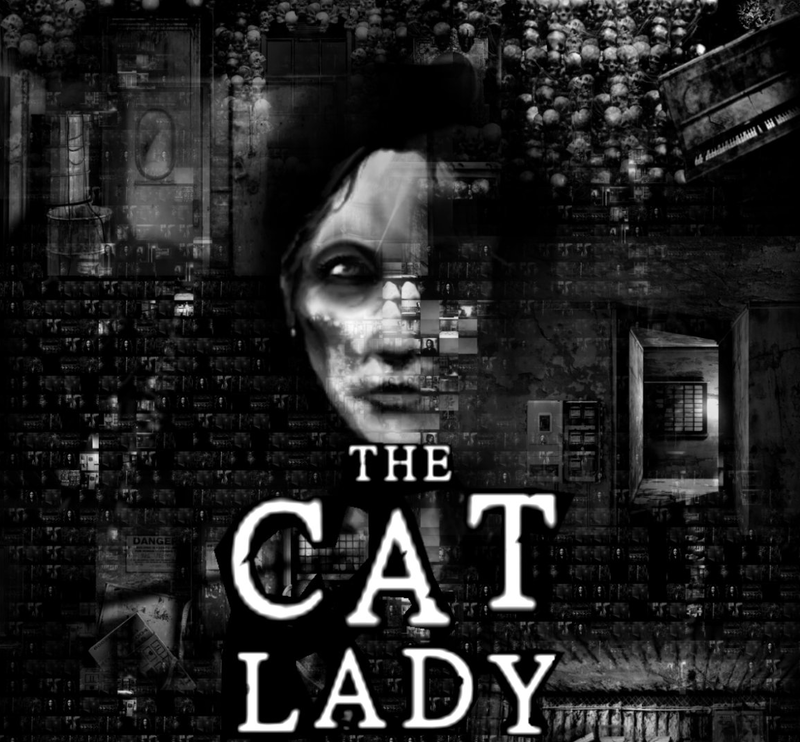 In contrast with Hellblade, the protagonists in The Cat Lady and Fran Bow are alike in that they interact with numerous other characters and develop meaningful relationships both due to and in spite of their mental illnesses. 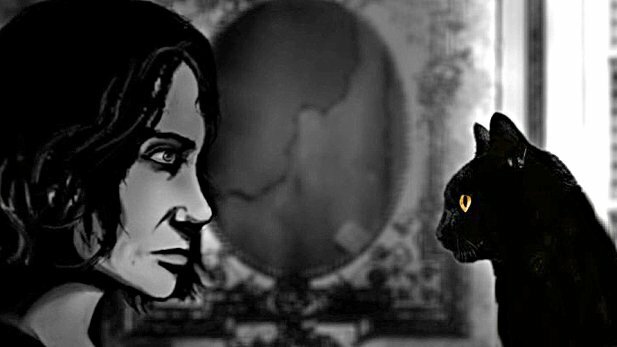 The Cat Lady is the story of a lonely middle-aged woman named Susan who has severe depression and whose only companions are stray cats. The game opens with Susan committing suicide, but she wakes up in purgatory and is brought back to life by the goddess of death to rid the world of five evil “parasites” who are all either serial killers, cannibals, or murderers. Although Susan longs for death, she is immortal and granted a form of true sight while she faces and defeats the parasites. 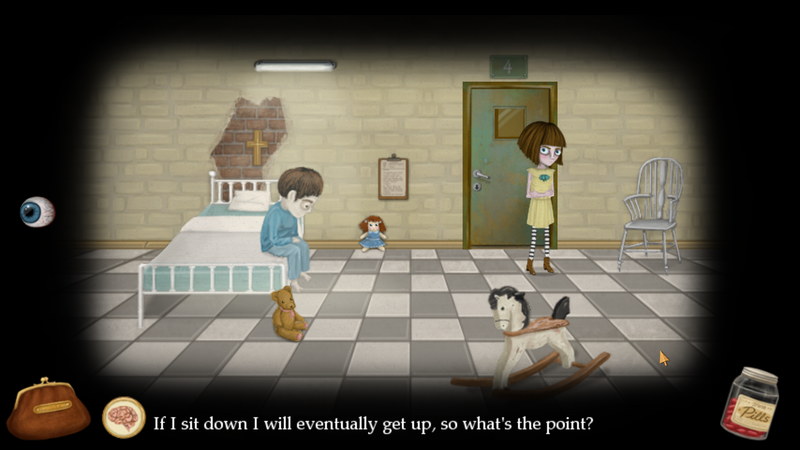 Throughout the game, Susan is unsure about whether the strange visions she sees and horrible events she experiences are real or if she is mad. However, her immortality and true sight allow her to defeat all five parasites, save many lives, and help a new friend overcome traumatic experiences. Susan actively makes the world a better place and finds companionship because of, rather than despite, her mental illness. Susan’s fate depends on the player’s choices, and the “good” ending leaves her once again alone and still struggling with depression, but with a willingness to continue living. Fran, from Fran Bow, in the asylum where the game takes place. Her pills are visible at bottom-right. Fran Bow invites players to become a 10-year-old girl who, after witnessing the violent murder of her parents, is committed to an asylum. The game is set in 1944, and as a young girl and an orphan, Fran is denied a voice and agency in the asylum. The trauma of witnessing her parents’ murder has caused her to erase the event from her memory and throughout the game she must uncover the truth about their deaths and reunite with her black cat and only friend, Mr. Midnight. In the asylum, Fran is given an experimental drug to treat her perceived madness. However, whenever Fran takes one of these red pills, she is granted true sight revealing vivid and grisly hallucinations which hint at a parallel world full of dark shadows, monsters, mutilated bodies, and extreme violence. These visions reveal secrets and truths to her, allowing her to escape the asylum and, eventually, to find her cat and make strange new friends. Like the red pill in The Matrix (1999), this medication appears to awaken Fran in a way which allows her to perceive reality more fully. And, again like The Matrix, the reality these pills reveal is dark, unpleasant, and violent. Although they allow her to solve puzzles, and therefore allow the player to proceed in the game, Fran Bow never frames these pills as a good thing. Indeed, through the excessive use of the pills and her gradual realization about her involvement in her parents’ death, Fran’s mental state worsens, and she loses the ability to discern between reality and her hallucinations. The game leaves everything ambiguous, however, and never dictates which parts occur in reality, which parts occur in a parallel world, and which parts occur in Fran’s mind. Fran Bow can be read as a twisted homage to Alice’s Adventures in Wonderland (1865), a novel which also features a young girl and her cat as they adventure through a fantastical world that may or may not exist solely inside her mind. Alice’s Adventures in Wonderland is a popular source text for discussions of the intersection between madness, gender, and fantasy, and imagining dark, twisted version of the story is not a new approach. Games such as American McGee’s Alice (2000) and Alice: Madness Returns (2011), films like Tim Burton’s Alice in Wonderland (2010), and shows like ABC’s Once Upon a Time in Wonderland (2013-2014) all involve an older Alice who has been institutionalized and labeled mad because of her belief in the existence of Wonderland. Given our history of witch hunts during the 15th-18th centuries and imprisoning, torturing, and murdering women diagnosed with “hysteria” or otherwise labeled mad or dangerous since the 19th century, stories of women being disbelieved and declared “insane” or evil by male authority figures are understandably common in our society. The Cat Lady and Fran Bow incorporate this cultural trauma into their narratives and although both games are shockingly gory, morbid, and macabre, they do not just treat psychosis as spectacle. 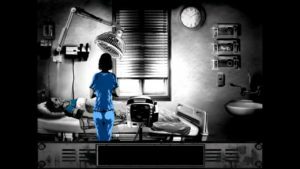 Both games address grief, guilt, trauma, depression, recovery, and self-discovery while serving as cautionary tales about the efficacy of medication and the problems with clinical psychiatry. These games also demonstrate the disempowerment faced by people with mental illnesses, especially women and children. 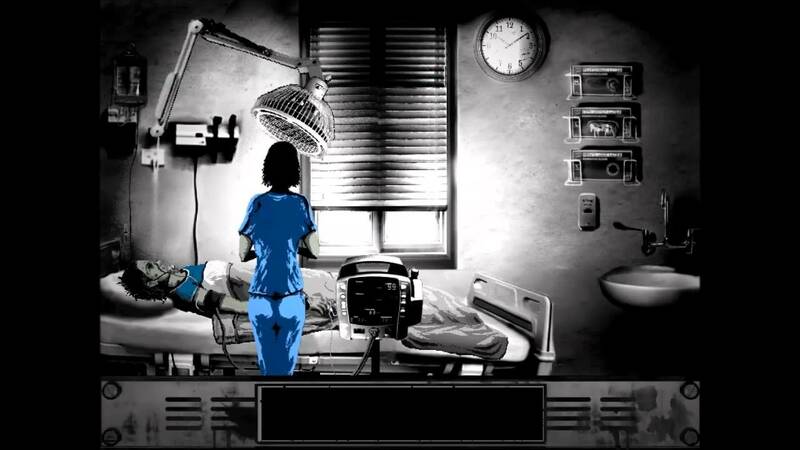 Both games are dark but also allow for hope while demonstrating that a happy ending does not necessarily mean that the protagonists are cured; rather, they have begun to heal. Sarah Nixon (2013) has written about the harmful use of the asylum and mental illness as cliché settings and tropes in horror games and how this practice perpetuates harmful associations between mental illness, violence, and horror. Although Fran Bow does begin in a children’s asylum and presents the asylum as a horrific setting, it is not horrific because of the mentally ill patients detained within. It is horrific because of the callous nurses, the abusive doctors, and the gruesome techniques used on the children to “cure” them. The patients in the asylum are not the source of the player’s discomfort and fear; rather, the asylum itself as an institution of violence and torture is the foundation of horror in this segment of the game. 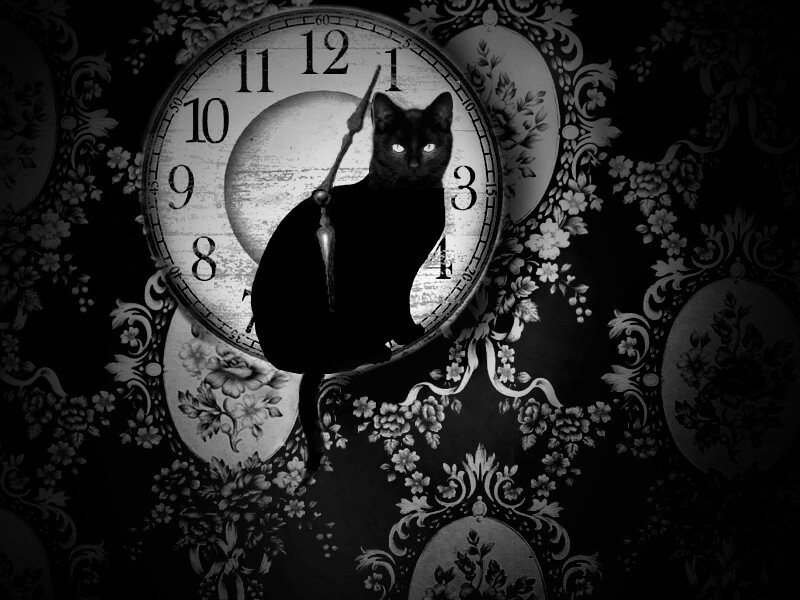 While The Cat Lady does not include an asylum among its many settings, it does place Susan in a hospital ward after she wakes up from her suicide attempt. Susan is forcefully sedated and detained in the ward by condescending nurses who intend to keep her there until she is fully evaluated and cleared for release by the patronizing male doctor assigned to her. Just as Susan is escaping the ward, she is caught by the doctor who incapacitates and kidnaps her, planning to torture and murder her. The doctor is a serial killer, one of the parasites, who turns his female victims into grotesque artworks made of human flesh. In both games, hospitals and health care professionals are framed as cruel or even evil, subjecting their vulnerable patients to torturous procedures or outright murdering them. While this is not an accurate or healthy construction, it does subvert the trope of asylum patients as “murdering psychopaths” and reinforce the message that people with mental illnesses have often been disempowered and victimized by the violence of medical practices and discourses. Susan, from The Cat Lady, lies on a hospital bed; the nearby figure keeps a watchful eye on her. Although medication is generally used to suppress psychosis, in both Fran Bow and The Cat Lady, medication is instead used to unlock or enhance Fran and Susan’s ability to see what is “really” there. The red pills in Fran Bow are given to her by her doctor, even though he knows that they cause extreme hallucinations, because he wants to use her as a guinea pig for the experimental drug. Similarly, in The Cat Lady, Susan is given medication against her will, and she reads on her chart that it can cause hallucinations and paranoia. Like Fran’s red pills, when Susan is given this medication, a dark, parallel version of the hospital ward is revealed to her, and by interacting with aspects of this vision, she is finally able to escape from the ward – at least until the doctor catches and kidnaps her. In The Cat Lady, the use of medication to enhance visions is only featured in one chapter, whereas in Fran Bow the pills are used throughout the game as switch for Fran’s visions. This was an unfortunate choice by the developers, as it reinforces the incorrect assumption that people with mental illnesses can use medication to switch their illnesses on and off, or switch between moods, personalities, or realities. However, Fran Bow does address this issue late in the game: after losing her pills, Fran continues to experience increasingly strange and fantastical realities. In fact, at this point in the game the player is no longer sure whether the world is real, a parallel reality, or if it exists solely in Fran’s mind because “switching” between realities is no longer possible. Gameplay continues regardless, and Fran herself never seems to question what she sees – for her, it is all equally real and meaningful. In this way, Fran Bow complicates the true sight trope of ‘seemingly mad but actually right all along’ as there is no clear indication that anything Fran saw was truly real. However, since this is a story about Fran’s self-discovery and healing, the game suggests that it does not matter whether what she sees exists outside of her or within her own mind. In both games, the female protagonists are considered delusional by others (particularly patronizing and immoral male doctors) but they understand that the dark, twisted, violent, and disturbing things they are seeing or experiencing are either real or are another form of reality. This is a notable challenge to the more common ludic approach to madness in the form of sanity metres; as Patrick Lindsey (2014) notes, the depletion of the sanity metre generally makes the protagonist start to hallucinate, suggesting “that mental illness sufferers are somehow damaged; that their perception is untrustworthy and not representative of what things are ‘really’ like, that their experience of reality is somehow less valid than that of ‘sane’ people” (para. 10). Although Fran Bow and The Cat Lady take the opposite approach, outside of video games, this is nothing particularly new. Speculative fiction is full of characters who possess what I have called “true sight” but what might also be called clairvoyance. Some characters can “touch” other people’s minds and have prophetic visions, like Alain Johns and Eddie Dean from Stephen King’s The Dark Tower series (1982-2004). Other characters have prophetic dreams, like Anakin in Star Wars: Episode II (George Lucas, 2002) or Frodo Baggins in The Fellowship of the Rings (J.R.R. Tolkien, 1954). Some are simply better at opening their eyes “fully” and seeing what others refuse to see, like the witches in Terry Pratchett’s Discworld series (1983-2015). These characters are often framed as gifted heroes who must struggle against their self-doubt and learn to believe that what they see has truth, meaning, or is actually real. Often, they are labeled delusional or mad and need to prove the existence of their power to others. Indeed, in media which feature characters with this ability, the power is both a blessing and a curse, alienating them and making them behave in seemingly erratic ways, but also allowing them to achieve their goals. As with Hellblade, The Cat Lady and Fran Bow are guilty of turning mental illness into a superpower; however, there is value in attempting to represent madness as more than just an illness. Madness, particularly psychosis, can be framed as an alternative way of seeing the world, and these stories of vulnerable people who come to terms with their illnesses and actually use them or channel them in a way to help themselves and others might provide an empowering experience for neuroatypical players. Importantly, these games do not simply follow the narrative set-up common to the speculative fiction mentioned above in which a given character seems mad but is actually right all along. Both Susan and Fran do have mental illnesses: Susan has depression and Fran has trauma-induced amnesia and, as indicated by the loss of the pills late in the game, she does not differentiate between fantasy and reality. And so these characters, at least for the purposes of helping others, defeating evil, and beginning to heal, are both mad and right all along. In addition, as the protagonists, Fran and Susan are positioned as sympathetic characters with whom the player is encouraged to identify. They are not solely characterized by their mental illnesses, rather they are interesting, fully developed characters with unique personalities and deep backstories who also have mental illnesses. This is important because, as Lindsay Goto (2015) argues, “[p]eople are not their mental illnesses. While it can be a big part of people’s lives, it does not push out the other traits that they have” (para. 9). As with any identity, it is important to have diverse media representations of non-stereotypical characters with various mental illnesses and to give voice to a wide range of experiences and stories. The particular strength of all three games discussed above is that they feature female protagonists with mental illnesses and emphasize healing rather than curing. In Fran Bow and The Cat Lady, the clear message is that people with mental illnesses can help others and themselves, can overcome adversity and live with trauma, and can form meaningful relationships. Through the format of psychological horror, these games ultimately vindicate their heroines and give them the possibility of being hopeful, courageous, and mad or depressed. Popular culture continues to associate madness with violence, irrationality, and evil; however, despite their shortcomings, games like The Cat Lady and Fran Bow are at least trying to do something different by presenting more empowered, sympathetic, and nuanced mad characters. Although most games tend to follow problematic stereotypes and tired tropes, the critical acclaim and popularity of these two games, as well as others like Depression Quest (2013), Actual Sunlight (2014), There Are Monsters Under Your Bed (2014), and Hellblade, may indicate a trend towards more fully researched or autobiographical, respectful, and empathetic representation in games. ABC Studios (Producer). (2013-2014). Once Upon a Time in Wonderland. United States: Disney-ABC Domestic Television. Barry, A. (2015, Mar 21). Mentally ill characters: Another kind of damsel in distress? Not Your Mama’s Gamer. Briers, M. (2017, Aug 9). Hellblade and why mental illness needs the mainstream spotlight. PlayStationLifeStyle. Burton, T. (Director). (2010). Alice in Wonderland. United States: Walt Disney Studios Motion Pictures. Chang, E. (2017). A game chooses, a player obeys: BioShock, posthumanism, and the limits of queerness. In J. Malowski & T. M. Russworm (eds. ), Gaming Representation: Race, Gender, and Sexuality in Video Games (227-244). Indiana University Press. Faulkner, J. (2017, Aug 15). ‘Hellblade’ tries to show the real experience of psychosis — but ends up using it as a plot device. Mic. Gerardi, M. (2017, Aug 8). Hellblade’s battle with mental illness is an agonizing story only games could tell. The A.V. Club. Goto, L. (2015, Mar 16). Vilifying mental illness: Horror games & the insanity trope. FemHype. Gygax, G., & Arneson, D. (1974). Dungeons & Dragons. TSR, Wizards of the Coast. Harvester Games. (2012). The Cat Lady. Microsoft Windows. Killmonday Games. (2015). Fran Bow. Microsoft Windows. Kim, M. (2017, Aug 9). 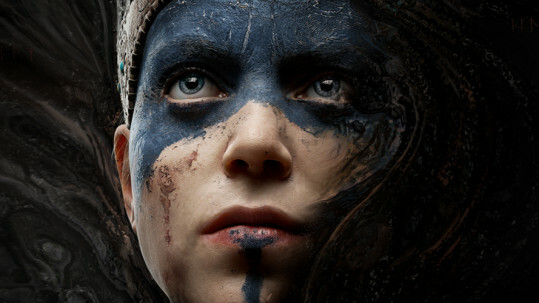 Hellblade creates empathy for mental illness through game design. USGamer. Lacina, D. (2017, Sept 15). What Hellblade: Senua’s Sacrifice gets wrong about mental illness. Polygon. Layne, A. (2016, Dec 26). Incoherent worlds: Video games, madness, and subversion. Not Your Mama’s Gamer. Lindsey, P. (2014, Jul 21). Gaming’s favorite villain is mental illness, and this needs to stop. Polygon. McKeand, K. (2017, Aug 8). Hellblade is frustrating, confusing, and uncomfortable, but that’s the point. PCGamesN. Ninja Theory. (2017). Hellblade: Senua’s Sacrifice. Microsoft Windows. Nixon, S. (2013, Sept 12). They’re mad, I tell you: Portrayal of mental illness in video games. Not Your Mama’s Gamer. Quinn, Z. (2013) Depression Quest. Twine. Microsoft Windows. Rogue Entertainment. (2000). American McGee’s Alice. Microsoft Windows. Scaife, S. (2017, Aug). Two steps forward, three steps back: how Hellblade reinforces myths about mental illness. Zam. Souppouris, A. (2015, Aug 20). Video games are tackling mental health with mixed results. Engadget. Spicy Horse. (2011). Alice: Madness Returns. Microsoft Windows. Tremblay, K. (2014). There Are Monsters Under Your Bed. Twine. Microsoft Windows. Wachowski, L., & Warchowski, L. (Directors). (1999). The Matrix. United States: Warner Bros.
WZO Games Inc. (2014). Actual Sunlight. Microsoft Windows.